FO: Baby Sharks! | Stitch, Brinn, Stitch! Mods: I apparently made the snout pointier than I usually do. 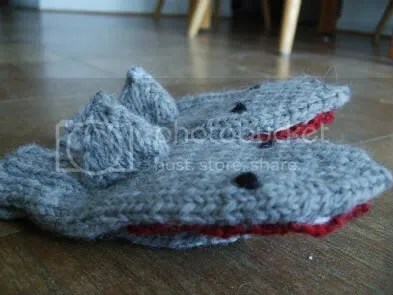 Baby shark mittens are adorable. They are also hella quick, despite what the Ravelry project page will tell you about the time I spent knitting them (it says like a week, but I was working on other things). 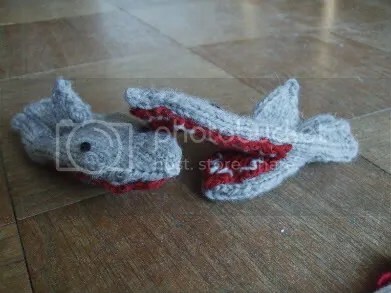 Also, I love knitting shark mittens. They’re so cute and fun. : ) Definitely one of my favorite things I’ve ever knit. In other knitting news: Socktoberfest is fast approaching. And I knit socks now. So THAT’S HAPPENING. I’m planning to knit as many socks as I can (plus my Halloween cape. And a Liesl sweater for a WWFY swap). I think I can probably do at least one. Both the sweaters are in worsted weight, at any rate. So Socktoberfest. Who’s with me? Hmmmm….Socktoberfest sounds interesting. I think i need one about baby blankets though 😦 I need to get that done soon….